NEW YORK–(BUSINESS WIRE)–JetBlue (Nasdaq: JBLU), the largest airline at Fort Lauderdale-Hollywood International Airport, today announced a special partnership with the VH1 Save The Music Foundation to reintroduce music to students at Henry H. Filer Middle School in South Florida. This school located in Hialeah, Fla. has been without a music program for more than nine years. On August 28, 2018, JetBlue and VH1 Save The Music joined forces to donate musical instruments so the school can add music back to its curriculum. 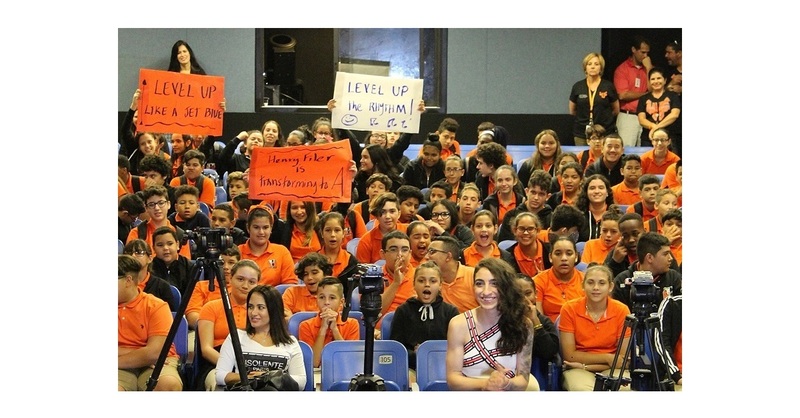 As a special surprise, singer/songwriter Emily Estefan performed a pop-up acoustic set at a special school assembly. To round out the donation event, singer/songwriter Emily Estefan surprised students, teachers and administrators with a special performance. Growing up surrounded by music, Emily naturally developed a deep passion for the craft at a very young age. That passion grew as she did. Emily founded Alien Shrimp Records, after earning a degree in contemporary writing and production from Boston's Berklee College of Music, in the hopes of cultivating a haven where emerging artists – herself included – can truly express themselves creatively. JetBlue For Good – Giving back is part of JetBlue’s DNA and is core to its mission of inspiring humanity. Centered around volunteerism and service, JetBlue For Good focuses on the areas that are most important to the airline’s customers and crewmembers – community, youth/education and the environment. Combining JetBlue’s corporate efforts with its customers’ and crewmembers’ passions, the common theme is Good – JetBlue For Good. Join the #JetBlueForGood conversation on Twitter, Instagram and Facebook, check for regular updates and get involved. JetBlue is New York's Hometown Airline®, and a leading carrier in Boston, Fort Lauderdale – Hollywood, Los Angeles (Long Beach), Orlando, and San Juan. JetBlue carries more than 40 million customers a year to 102 cities in the U.S., Caribbean, and Latin America with an average of 1,000 daily flights. For more information please visit www.jetblue.com. VH1 Save The Music Foundation, Inc. is a New York 501(c)(3) nonprofit that helps kids, schools, and communities realize their full potential through the power of making music. Since 1997, the Foundation has donated $56M worth of new musical instruments to over 2,100 public schools in 261 school districts around the country—impacting millions of public school students. Get involved at vh1savethemusic.org.